When it opens in 2015, the Portland-Milwaukie Light Rail Transit Project will improve transit and connections throughout the region. But the project has been benefiting the community since construction began in 2011, especially small firms owned by people of color and women, or Disadvantaged Business Enterprise (DBE) firms. 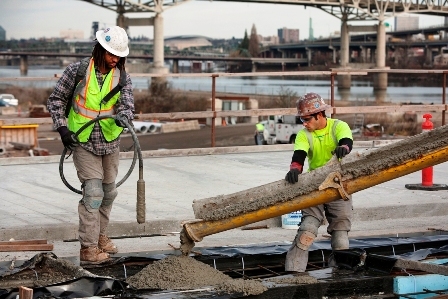 Workers pouring concrete as part of the Portland-Milwaukie Light Rail Transit Project. TriMet’s award-winning DBE program promotes a level playing field, removes barriers and increases contracting opportunities for people of color and women in both the professional and construction fields. The light rail project is also bringing family-wage jobs to more of the region’s residents. Twenty-five percent of the construction jobs are held by people of color and over 17 percent by apprentices. With this influx of new labor, the DBE program is not only providing jobs now, but creating the workforce of the future. TriMet created its innovative award-winning DBE program back in 2000 when it was getting ready to build the Interstate MAX Yellow Line project. The community had concerns that past projects didn’t provide enough local opportunities. TriMet delivered $36 million in contracts for that project; $62 million for the MAX Green Line, and now topping $170 million for the Portland-Milwaukie project. These successes have made TriMet’s DBE program a model for the nation. “Inclusive contracting is part of how we do business, and our prime contractors embrace that same vision to make sure DBE firms have a shot at these contracts,” said TriMet Executive Director of Capital Projects Dan Blocher. Dr. Bethel announced that Prime Contractor Stacy and Witbeck was selected as the DBE Champion of the Year Organization Award. Dr. Bethel said that Stacy and Witbeck’s commitment to inclusive contracting is “part of its DNA. They’ve consistently identified new opportunities for small firms and have mentored and helped build capacities of these firms.” Stacy and Witbeck has achieved more than 22 percent DBE participation on the light rail project. Tilikum Crossing lights up the sky! During the awards celebration, the nearby aesthetic lighting test for the Tilikum Crossing, Bridge of the People began. DBE firm O’Neill Electric Inc. installed the lighting and electrical components as part of the Portland-Milwaukie Light Rail Transit Project’s Public Art Program. The light rail project is on time and on budget and set for its Sept. 2015 opening.